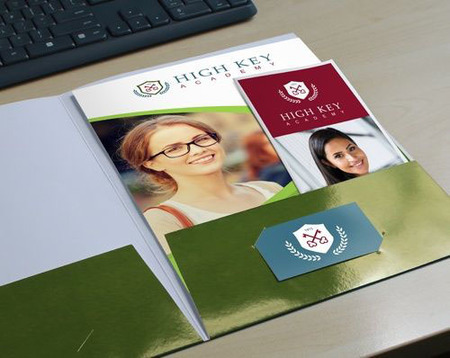 Whether you are sending out promotional materials to advertise your school or reporting a child’s progress to their parents, it’s important to add a touch of professionalism to your school brand. Keep important files that you need to present in an organized fashion with school folder printing. Here at PrintPlace.com, we know that your school brand embodies your mission and vision as an institution. That is why we provide a school folder printing service that you can fit perfectly to your school brand. We are equipped with state-of-the-art equipment that can customize your school folders in a variety of sizes and other design options. You can design your folders with school mascots, insignias, or images of your students and faculty on the front side or both sides of your folder. Our school folder printing also has the option for inside pockets to keep your papers safe, as well as optional slits for business cards and CDs. Are you on a tight deadline? Our school folder printing is available with same-day or 1-day turnaround option. Call our print experts for additional custom options or fill out our custom order form. Our school folder layout templates will ensure your artwork meets requirements for printing. School folder layout templates are available in EPS, JPG and PDF formats for front (outside panels plus pockets) and back (inside panels) printing. The die line, including pockets and business card slits (if applicable), will show on the PDF proof for your final approval. Custom school folder printing is an excellent way to gain a favorable impression with potential parents, students, and investors alike. With school folders, you can showcase your identity as an institution while giving recipients a useful tool to organize your files and promotional materials. As a marketing material, you can use school folders to store school flyers and brochures in one place. You can then give these folders to parents looking for the best school for their children, or investors willing to sponsor your school. For educational purposes, you can use them as a welcome kits or back-to-school folders to keep school stationery and other useful files. Additionally, you can use them to organize school reports that you can give parents to check their child’s school progress. Call our friendly print experts to print school folders today.